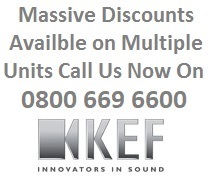 All of Kef's CR are all circular in shape and made for flush mounting into ceiling voids or walls, the Ci series delivers KEF legendary quality as unobtrusively as possible featuring some of the thinnest bezels on the market. All of Kef's custom speaker models are designed to withstand a multitude of environments including bathrooms and under the eves outside. The Ci160CR delivers Hi-Fi quality sound through a polypropylene cone low frequency driver with a high frequency driver mounted at the acoustic centre of the LF drive unit. The bezel and grill can be painted to match the interior decor of the room. 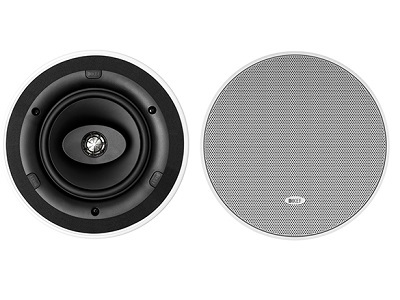 The Ci Series Ci160CR comprises 19mm aluminium dome tweeter with 160mm white polypropylene bass/mid unit with double neo compound magnet system. Performance should meet or exceed the following criteria: frequency response be 52Hz to 20kHz, sensitivity shall be at least 87dB for 2.83V@1m. The impedance shall be 8 ohms.